“Soft Start” is a device for limiting high short-lasting electricity in the moment of attaching the transformer onto network. 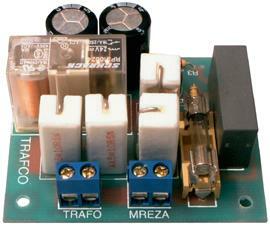 It is suggested for the transformers on power range of 300 – 3000VA and with primary voltage of 220V. A device is to be installed in appropriate box or directly inside a device. Soft start connects in series very strong resistors with the primary spoil and in such way limits the passing currency that is increased due to magnetized core. After 0.5 – 1 second, contacts of relays bypass the resistor that turns them off the power circuit and transformer continues regular work. There is a base for the fuse situated at the printed plate, that protects the transformer from short-circuit and over-loading, and needs to be selected depending of power. During turning off and turning on the process is automatically repeated. Note: In case network voltage is less than 180V soft start will burn down! You can select the value of the chart which is written down at the instruction for installing soft start which is received with the equipment. The fuse is not delivered with the equipment.